This week The Corbett Report was sent documents purported to be the notes of an attendee of the recent Toronto G20 meeting. The documents, if genuine, show that the recent meeting once again gave the G20 a chance to discuss global government as an answer to the ongoing economic meltdown and reaffirm that carbon taxes are high on the globalists’ priority list. The idea of funding a nascent global governmental structure through the introduction of carbon taxes is by no means a new one. The notes were obtained from a source inside a South African bank whose CEO was a confirmed attendee of the Toronto meeting. According to the source, they are most likely notes from a feedback session between the CEO and bank officials upon the CEO’s return from the conference. Download the documents in PDF format via this link. According to the documents, the delegates concluded that a process of fiscal consolidation would be the key solution to the crisis, involving country-specific ideas with central coordination…presumably by the G20 itself. Although the delegates evidently discussed the need to address the sovereign debt crisis “through cutting expenses and not through increased taxes,” that statement is immediately followed in this attendee’s notes by the idea of introducing carbon taxes. The idea of funding a nascent global governmental structure through the introduction of carbon taxes is by no means a new one, having been proposed as a funding mechanism for a North American Union at a secret Security and Prosperity Partnership meeting in Banff, Canada in 2006. Perhaps not coincidentally, the idea was last floated in the G20 Finance Ministers’s meeting in Scotland last year. In leaked documents from that meeting it was revealed that attendees had seriously discussed the possibility of using a carbon tax to fund an international financial body which would supposedly be entrusted to look after climate adaptation and mitigation programs. That the carbon tax was discussed during G20 deliberations comes as no surprise. Nor does the fact that the delegates deliberated on the need “to develop Global governance structures” and the desire for “coordination across countries.” The urge to use a manufactured economic crisis to institute a new international system of governance administered by the very bankers who created the problem in the first place has likewise been noted for years. But there are hopeful signs that the globalists’ agenda is being derailed by a mass political awakening among the public, exactly as key globalist Zbigniew Brzezinski discussed in a recent speech. Perhaps the foremost hurdle to the implementation of the G20’s plans comes from fierce opposition to the carbon tax agenda in the United States exemplified by the fact that the current Senate climate bill is likely dead in the water. Another hopeful sign are those passages of the leaked documents that seem to suggest that national governments may be diverting from the globalist agenda in order to protect their national interests, including repeated references to the specter of increased protectionism as a result of the global downturn. 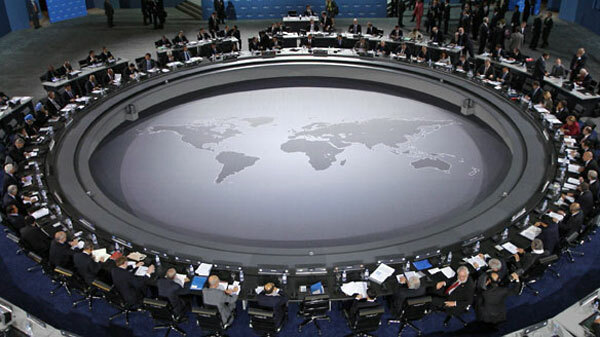 On a more ominous note, however, are references to the need to create a “B20” or “Business 20” to give unaccountable multi-nationals an even bigger stake in the nascent global governmental structure inherent in the G20 structure. This year’s G20 drew the ire of Canadians and concerned citizens around the world for its $1.3 billion security budget and brutal treatment of protestors. The next G20 summit will take place in November in Seoul, Korea.